With the men's world cup building towards some crucial games Rugby Player Magazine has now moved from monthly to weekly issues - and a good read it is too, even if the women's rugby page seems to have gone to sleep for the duration. Incidentally, on the subject of the media the author of the Women's Rugby Review blog has now had media recognition for his efforts. He actually runs two blogs - one the above unique and ground breaking review of women's rugby news worldwide, the other (Total Flanker) a random collection of musing devoted to the male game - amusing but not wildly original. Now which one of his two productions - launched at the same time - do you think The Times newspaper has now picked up and highlighted as its site of the week? As its not a club fixture tomorow we haven't arranged any official meet time or transport arrangements - the assumpion is that if you want to go you will have made arangements by now! However its not too late - if you are still looking for a lift give me a ring asap. Start time is 1.30pm for a 2pm start at Welwyn RFC. On 6 & 7 October, the North Hertfordshire Voluntary Sector Fair ("GET INVOLVED!") is at the Plinston Hall. This event is for charities and clubs to present what they do to the public to attract volunteers or new players to their organisation. 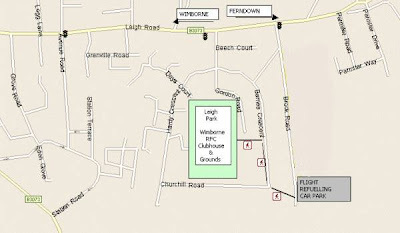 Letchworth Rugby Club Girls Section will be on stand no. 15 in Plinston Hall and the main club stand is directly opposite us. We will be using the display we put up at the RFU presentation evening and, hopefully, we'll be showing the promotion video as well. Our main objective is to encourage more girls to play rugby at Letchworth so that the future of the teams in all age bands is secured. Although the stand will be set up and run by one or more of the Alcocks, we would very much appreciate some help from players in both age groups who could be on the stand during the days to tell potential new players all about the girls' teams at Letchworth (somehow, I think that discussing the club/game with girl players is much more likely to persuade them to join us than if they talked to a BOG (Boring Old Git) like me!!). Also, if the same people are on the stand all day they may become, shall we say, a little jaded by the end of the proceedings so I would much rather have more people helping for say an hour, or two, each. Obviously, we need to have people on the stand at all times (10am to 5pm on Saturday 6th/midday to 4pm on Sunday 7th) but it is only fair to point out that there are World Cup quarter-finals at 2pm on both days (involving the winners (Sunday) and runners-up (Saturday) from England's group!). So if you can help on the stand for an hour or two, please let Mike know when you are available and he will then draw up a rota. The Regional 10s, which were due to be played on October 7th, have been postboned to April 20th and the National 10s, which was planned for October 28th, has been postboned to May 5th (Bank Holiday Monday). This change means we will have an extra day of training at Letchworth on 7th October before the Rochford 10s tournament the following weekend. We will try to get an alternative fixture for October 28th. In the spring, the Regional 10s take the place of one of the Regional training days and the National 10s are now on the day after the Worthing 10s Festival ..... ! For any of you girls who would like to take a level 1 coaching course but have been somewhat put off by these being done on Sundays when you want to be playing for the club, there's some good news : there is now an intention to run level 1 and level 2 coaching courses on Saturdays if sufficient interest is shown. 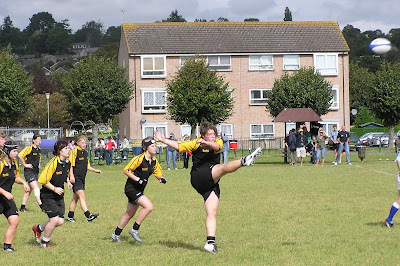 Obviously, in return for the course being paid for by the RFUW, those who take it will be expected to do some coaching for girls rugby at schools or clubs. Also please note that, as far as I understand it, you need to be at least 16 years old to do these courses. If you are interested, please let Heather know. The second day of county training and trials is taking place at Welwyn this Sunday (30th September) where the county selections will be made for both U18 and U15 squads. There was a disappointing turnout at the first county day this year and the county are keen to see as many of you as possible this Sunday as they wish to have two teams in each age band this season. It is worth pointing out that, particularly at U15 level, enthusiasm is far more important than experience so don't let the fact that you're a newcomer to the sport hold you back! "... but above all win"? Is that right? Something about the Basford* blog (see below) has been bothering me... and its the header. "Play with the spirit of the game. Enjoy, make lasting friendships, but above all win!!!" There is a degree of tongue-in-cheekness about this, obviously, but even so it has had me thinking... "but above all win"... is winning really the most important thing? I grant you that I may be quite terribly out-of-date here but frankly I would not even put it in the top three. I will admit that for professional sportspeople winning really IS number one. It is, after all, their job and livelihood - but its also true that, when it comes down to it, many professional sportspeople do not truly enjoy playing their sports anything like as much as you do. You doubt that? Well look at how many stop playing as soon as the money disappears! Professional sport is a different world with different values - values that dominate the sporting media and therefore infect our game. But that does not make them right. What we play is amateur sport - moreover junior amateur sport - and to my view to say that winning here is the most important thing is plain wrong. After all, for every winner there must be at least one loser - but does that mean the "loser" has failed? Did we "fail" yesterday merely because we lost the match? I think from all your reactions the answer is clearly no - you were all proud of your performance, and justifiably so. Participation. Just simply being there, being part of something bigger than you, being part of a team and taking on the challenges that flow from that. It means giving up stuff sometimes - like your entire Sunday - and it can be hard work (ie. getting out of bed at 6am when everyone else is having a lie-in) but its always worth it. Playing as well as you can. There is a satisfaction that comes from knowing that you have put everything you can into something - that you have tried as hard as you could - regardless of the actual outcome - yesterday was a prime example. Equally a win achieved without trying too hard often seems to lack something. Self-improvement. Kind of flows from 2. Simply getting better at something, taking on a new and higher challenge, and succeeding in it. Playing your first game, making that first tackle, working in a new position, running faster, kicking further. "Making friends", as the Basford blog has it. Being the team (and club) that people remember playing for all the good reasons, and want to play again. Its a truism, but worth repeating that results are often forgotten after a few weeks - but reputations can last a lifetime. Winning comes in around here I think. Its important - you need to play to win otherwise there's no point - but more important than any of the above? No - well, I don't think so. As sporting values go I think this is what is described as "Corinthian", and much derided, but in the end I think it guides my views on sport and - I think (partly as a result? )- our team's. In the end what is most important to you - a box full of medals or a circle full of friends? 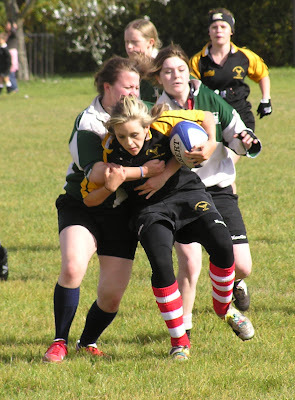 Basldon/Rochford have become latest team to launch a blog, starting with a report on last weeks events - see http://basfordgirlsrugby.blogspot.com/ for more. Wimborne is a long way. I think we kinda knew that anyway, but the fact that Hayley et al managed to get through virtually all of Matrix Revolutions on the way down before we even made it to Hampshire (let alone Dorset) was indicative. Randy's iPod filled in the rest of the journey, as did the Two Towers on the way back once we had dropped Randy off with her machine gun toting friends - but more on that anon. After all the main reason for spending five hours in a car with the sound system turned up to 11 was to get to the match - and it wasn't a bad one too. It has to be said that a fair few people have been looking on this game with a degree of trepidation. If there was a "Club of the Year" last season it was undoubtedly Wimborne, who seemed to come from no-where to dominate the U17 season with podium positions in all three national events - Cup, 10s and 7s - while at the same time remaining a pretty decent bunch. I think that there were some concerns that we were on for a damn good hiding, a concern that probably grew a bit when it was realised how many of our forwards we'd be missing. Come the day, though, our hosts (who were helped by Salisbury) lent us a few girls who played very well indeed against their erstwhile team-mates allowing a very competitive 15-a-side game to be played. 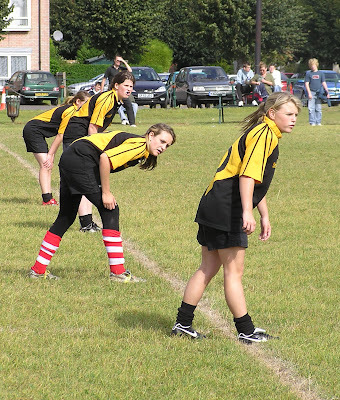 It was a real war of attrition, but a war in which gradually Wimborne gained the upper hand - their pack getting the better of the rather makeshift combination we had been able to field (certainly light on a prop - Carla filling in here, but its not her best position). Wimborne did close on our line near the end of the half, but it remained 0-0 and never looked like being much else. The second half did result in some more open play, perhaps as the forwards on both sides began to tire. Both sides were, however, guilty of not moving the ball quick enough - Wimborne possibly more than ourselves as we were lucky on two or three occasions when the centres suddenly came over all white-line fever when they had wings outside them with massive overlaps. The deadlock was, however, broken near the start of the second half - and one of our oldest problems was a key contributory factor, viz fannying around and ultimately fluffing responses to restarts. The Wimborne kick-off - which was not a deep kick - bounced around for seemingly an age with those nearest seeming to treat it as an unexploded bomb, and then when someone did take on the job of picking it up a rather wild pass (perhaps a result of the rapid arrival of the Wimborne hordes) seemed to hit Nikki(?) in the head. The referee then took a 10 metre exception to something that Sasha may or may not have said, and Wimborne now had a penalty well into our 22. Some sterling defence kept them out for fair while but we simply could into clear our lines and there was a degree of inevitability over the eventual score. The second try was - ironically - an object lesson in how to return a restart. In fact Randy's kick was very good - deep and into space - but Wimborne organised very quickly and were soon pushing deep into our territory. Again a long period of defence, but again we simply could not get it away, eventually their forwards driving over in the corner. As the clock began to run down we did finally stage an attack and were camped on their line for the last five minutes or so, but failed to take full advantage of a series five metre penalties and scrums, the ball being held up over the line at least twice before Wimborne finally cleared into touch to end the game. It was indeed a very early start - and a long journey - to Wimborne but it was a journey well worth making for the warm welcome and the excellent game of rugby. Letchworth were a little short staffed for this match due to a few previous engagements and Megan's wrist having not yet fully recovered so we were a travelling party of 11 players. However, Wimborne kindly furnished us with 4 players so we were able to play a very competitive - and close fought - 15-a-side match. The match was played in an excellent spirit and was a very well-balanced affair with the defences of both teams being equal to the challenge in the first half. Indeed is was not until the last quarter of the match that Wimborne scored their 2 tries and, even then, Letchworth continued to attack the Wimborne line right to the final whistle - getting within inches of scoring on more than one occasion but ultimately being denied by a very determined Wimborne defence. The match was a credit to all players on both sides but a special word of thanks should be said to those Wimborne players who gave their all playing for Letchworth. After approx. 250 metres turn into Flight Refuelling car park. Any problems/questions about the above - please contact Heather, John or Mike. First - any coaches (or prospective coaches) should be aware that there is a FREE "coach development evening" on Monday at the club from 7pm to 9pm. It will cover "front row and coaching contact". If you want to attend contact Dave Roberts. On a related theme confirmation that our new Club and Coach Development Officer (see below) will be Andrew Skipper, who will be covering Herts, Essex, and Eastern Counties. His brief is pretty wide ranging, but his interests will include those of you with (or thinking about acquiring) coaching qualifications. Incidentally one of his major tasks will also be to try to bridge the gap (gap? Grand Canyon more like!) between junior and senior clubs - a real issue for those of you turning 18 in the next year or so. Although that is nice and clear for East Region, I understand that Bedfordshire will have a different CCO from the rest of East Midlands as Maggie Alphonsi's "London" brief will include Berks, Bucks... and Beds. Slightly odd definition of "London"! Staying with county matters, Essex have confirmed that they will aim to get out a U12 team to play Herts at the Essex County Festival on 18th November - so definitely something for U12s to aim for. Due to fixture clashes with their new league Welwyn U18s will again not be at Rochford this season (their U15s will be). With Saracens also in a league it is therefore possible that we will be defending the Hertfordshire cause alone against all comers! Finally, details or travel arrangements for our trip to sunny Dorset this weekend shoudl be finalised tonight - but be prepared for an early start (c7.30am)! I know a few of you are thinking about your options for county this season. East Midlands have now provided me with details of their trials on 30th September. The trials will be at Kettering RFC, meeting at 1.30pm and start the sessions at 2pm. The day will be finished by 4pm. The day will include a match situation as well as a few warm up and drills. Players need to bring plenty of fluid, correct kit, and gum shields. If you are interested interested in going, or have any questions about eligibility (I understand that East Mids are being very lenient) contact Rachel Sawford Tel 07702779484 or email(Tel 07702779484 or rachels@emru.co.uk). And have a word with Fern as well, maybe. Remember - if you want to have any chance of playing regional rugby in the New Year you MUST get into a county squad first. You can also go to any number of trials and development days at any number of counties - you are only tied to any one county or region when you accept a place in a squad. Maths a bit tedious today? Nothing to do in a "free lesson"? Try this. There's fun little rugby-and-general knowledge quiz game on the BBC website. Officially you should go here but if you want to go straight to the game (a good idea if you haven't used the BBC's interactive services before as there is a rather tedious registration procedure) try clicking here - apart from anything else that should mean you get the game up full screen. If this backdoor doesn't work let me know and I'll look at the code again. I managed to get the final - but lost 17-10 to Australia. The questions get tougher depending on which team you choose, who you are playing, and the stage you are at in the competition. Any winners out there? Anyway before we get onto the U18s a word about the U15s, whose game I saw rather more of. A highlight of the game was Josephine Lohoar's debut. It was pretty impressive. 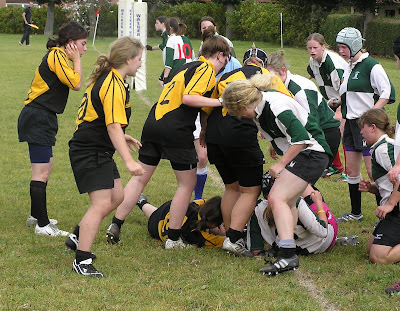 A small, rather nervous, slightly shy girl went onto the field and a hour later a confident, excited rugby player who looked about two inches taller came off. 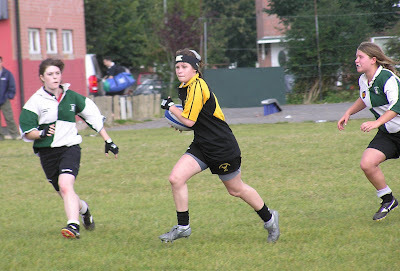 Moreover, a player with a well taken try to her name and (as someone said) "our new winger" - Josephine is seriously quick once she gets the ball in hand, but was also diving into rucks and joining in mauls by the end too. Basildon/Rochford did win the game - about eight or nine tries to three or four. In the end the score was not what was important (well, not at this end of the season) though it was significant that probably half those tries came in the first ten minutes of a 30 minute game. As Josephine and the other Letchworth girls grew in confidence so they competed more and forced their opponents to work harder. In the end there is no denying that "Basford" were the better side - but Letchworth played above themselves. If only we could find two or three more players... but we've said that before! Hopefully most of the U15s can make it next weekend - lets look to build on this good start. 1. Basford were far better prepared - but that is no surprise. They have been training practically since the last season ended, whereas we started only a few weeks ago. We have never previous played this early (in fact I'm not even sure we have played in September before) and it looks like it showed. 2. Starting a match with two key forwards missing and another three carrying injuries would normally be unfortunate. Going up against Basford - of all teams - its close to suicidal - I am impressed that you managed to win any ball at all! 3. Tactically it sounds as if we also played the (usual) high-impact game - from what I hear not much ball (when we had ball) was moved wide. In the past we have done well like that - but now without Nim to crash through and make the gaps we may need to rethink. We have scarily fast wings (or people who can play wing) - Randy, Natalie, Jess, etc. - and need to make more use of them this season. After years of being a forwards-based side does such a significant change in personnel mean we now need to look to quick hands and fast backs? 4. 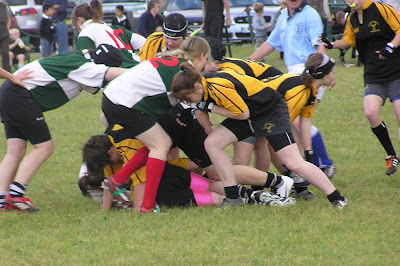 U18 rugby in 2007 is a world away from U14 rugby in 2005. 5. The defence sounds reasonbly solid - despite all the above only five tries conceeded in around a hour's play? Could have been worse - could have been MUCH worse! But then that was Basford and Basford are possibly unique. Its Wimborne next week - and they are masters of moving the ball fast. Ironically they are a team where keeping things tight with the forwards may be our best chance of success. Anyway - what do you all think? Where did things go wrong (or right)? For more pictures of both games click here. A member of the British Army Women's Inter Corps Trophy winners joins us this weekend... though the face may seem familiar. Yes - Randy's back for a couple of weeks, fresh from her first run-out with REME's adult women's team (apparently they can start playing with the senior team from 17 - and they wasted no time in calling Randy up) for whom she scored a try in a tournament at Aldershot on Wednesday. REME triumphed 17-5 over AMS (the Army Medical Service) in the final, retaining the trophy which they won last year, in a one-day tens competition which included teams from all six army corps. Randy's next test - once she gets back - will be to see if she and her teammates can follow on from that in the Women's Corps League, which starts on 17th October. In the meanwhile she will be with us for Basford this weekend and Wimborne next. ... plus a shade more confusion. The RFUW have appointed ten "Club and Coach Officers" (CCOs) for the new seasonto support the "development of women’s and girls rugby across the country" with an "extensive remit" which will include player development, coach development and club development. Each have been given a region... but at this stage its not clear who will be "ours" as, quite conceivibly, we could have one of three. This is because, although each has been given a "region" they do not seem to be the same "regions" as the 11 currently used by RFUW (where we are "East") or eight used by RFU (where we are "London North"). Anyway our most likely CCO will be Andrew Skipper who will be CCO of the "East". However as he is based in Ipswich its possible that we might not see too much of him. So it is possible that we might see more of Maggie Alphonsi who will be the "London" CCO. But London is a big place, and one we have never felt ourselves "part of", so it is quite likely that she will have her work cut out covering the capital without having to trail up to remote outposts in north Hertfordshire. Our third bet therefore might be one Laura Jayne Adams who is moving from the position of a Regional Judo(!) Development Officer and Community Rugby Coach to be CCO for "East Midlands". She will be based in Northamptonshire, which is a bit nearer than Ipswich, and being as we are increasingly getting involved in East Mids activities it is not unreasonable to suspect that she may take an interest in us. Finish by 11.00 (as there are other games due to start then). With several people picking up injuries last weekend could you please let us (me, Mike & Heather Alcock, Simon...) know - ideally by Thursday at the latest - whether you think you will be fit for Sunday, as if we are short it will only be fair to let Basford know. If you are unsure then I'd suggest resting an injury this weekend as we will be playing Basford again later in the season (at least twice). The main target for the minute has to be Wimborne - we have to aim to go to Dorset with as strong a team as possible. Not sure yet about start time on Sunday as we need a full pitch (obviously) and we hadn't "booked" one as we had been assuming this would be just a standard training weekend. Hayley: Soft tissue damage to shoulder - can play "when she feels able to". [PS: For county news remember to check the county blog (link and latest stories in the column on the left). Stuff appearing on the county blog will not generally be repeated on here]. I think the main thing to come out of the first county day of the new season is.... there is still plenty of time for new people to come along and join in! For some reason there was only about 25 U18s at the session, down a fair bit on last season, so I gather from those who took part that at the moment they will be sticking to that group and not formally selecting yet - so if you were away or injured you have not missed your chance. The U15s was not a trial so there is also time for other to join in - but they probably had as many girls as the U18s did - maybe more. Laura was our sole representative, towered over a bit by some seriously big players from other teams (mostly a couple of years older, it has to be said). I think its clear - if this was representative of players in other clubs - that the U15 band will be a very different animal to the U14 band last year! The new U12 age band also worked well. 14 girls took part, which was a good number, and half of them had not played contact before (they have now!). Again, though, there is room for more. Next County Day is 30th September at Welwyn, after which I think they will be looking to fixtures on future county dates. Just to add to the entry below that would appear that I was sent the forms last week but somehow or other didn't get the messsge. Or lost it. Or something. Anyway suffice to say that I have now received a further copy and you will now find that the Herts Blog (here). Anyone else need a lift on Sunday? Not a fixture as such, but on 16th September (ie. Sunday week) we will be joined at out training session by the girls from Basford (Basildon/Rochford). They are also facing fixture problems due ot the growth of leagues (see below) and wanted something a bit more challenging than the "usual" session in advance of their first fixture the following weekend. Should be a really good session. Not sure exactly what we will be doing on the day - and we may have to look closely at pitch availability which might mean a different start time - so watch this space for further details. A few of you - well in fact a whole chorus of you - asked about these this evening. To confirm that I haven't had any official forms as yet BUT if you look on the Herts blog you will still be able to download last year's form (PDF or Word). Could I suggest that you use this - maybe amending the date at the top - and bring that along on Sunday? As its not a fixture we haven't arranged any pick-up times. The day starts at 2pm, so registration will presumably be from c1.30, so I was working on a 1pm departure. If you need a lift please get back to me asap. The club are organising some "social events" to co-incide with some of the matches at the men's world cup being shown on the Big Screen. More details on the main club website. Calling all dual qualified girls! A bit short notice, but East Midlands are also holding a development day on Sunday. It will not be a trial (unlike the U18s in Hertfordshire) - the East Mids county trials are not until the 30th - but if you aren't really interested in playing for Hertfordshire and want to investigate the alternative then it would be a good opportunity to get your face known by the East Mids selectors, and maybe also get to see what you might be up against! The day will be held at Northamptonshire Old Scouts RFC, meeting at 1.30pm for a 2pm start training session and a finish at around 4pm. East Mids advise that you need to remember suitable clothing for the day including wet gear if it looks like rain and boots if you have them. A gum shield would be advisable as we will be doing contact work and a water bottle and any food you may wish to have. The bar will be open and food available to buy for you and you family to enjoy. Wales also play Canada in the Rugby World Cup that afternoon and that will be shown in the bar. If you have any questions about the day or would like to confirm you attendances please contact Rachel Sawford (Community Rugby Coach, Northamptonshire) on 07702 779484 or rachels@emru.co.uk. Little snippet of news that has reached me - apparently Welwyn have joined the South East girls league, going straight into Division One alongside Dorking, Esher, Gravesend, Havant & Petersfield, West Surrey District, Worthing and Wimborne. This is interesting for a number of reason, most significant of which to us is that as these leagues grow and draw in more sides it gets increasingly difficult for teams outside leagues to get fixtures. The reason we aren't playing Milton Keynes this season (and only played them once last) was because of their participation in the Thames Valley league. It raises the question of where we should be doing. Should we do the same? Welwyn always seem to have looked on themselves as being a "London" or at least "south" facing team so in many ways it is a logical step. At Letchworth, being further north, we've always looked the other way - almost all of our games over the years have been in east or the midlands (in fact the trip to Wimborne at the end of the month will, I think, be the first time we have ever played south of the Thames - apart from the National Cup and the tour) so following Welwyn's lead would not perhaps be appropriate (even before you look at the distances involved). The Thames Valley league might be an alternative, but at present is a competion for county-based "cluster" teams - would also involve long trips away from our "patch" to Oxfordshire and Berkshire. There are at present no leagues in East or East Midlands, though the matter has been discussed in East but has never really got very far. There were a numberof reasons for this - such as teams not wanting to be tied down - but also a general perference for "friendly" games during a period when clubs are developing, which is understandable. However I suspect that it will not be long before its raised again though - in East Midlands perhaps if not in East - and whatever we may think about league rugby once a league is formed in either region then we will inevitably have to join it. It would be a shame in some ways as it would mean a more limited diet of the "same" teams most weekends, which I know many of you find a bit frustrating already ("oh no - not x again!" was the cry that saw us enter the East Mids 10s last season instead of the "local" event) but it will be that or precious few fixtures at all! Anyway - what do you all think? Should we support (or even initiate) the idea of leagues in one region or the other (or both - we now have seats on both the East and East Midlands forums so we could raise it in either)? The club's "200 Club" is being revamped. On the last Sunday in the month, starting in September, a draw will take place where winning numbers will be picked at random. Over 12 months 50% of the pot will be returned in winnings and 50% will go to the Club. The value of prizes will be advised prior to the draw. A number in the 200 Club may be bought for just £2 per month, available via standing order mandates obtainable at the Bar and Shop and from Nick Cave from Sunday 2nd September. For every ten new members each section produces the club will give also give a £30 commission to that section. The men's world cup starts on Friday, which will mean that rugby will be getting big headlines and lots of press coverage. Its therefore going to be a good time to attract new players - and next weekend at the county day in Welwyn will be a great opportunity for anyone you know to "have a go" - especially if they are in school years 6-10. Failing that the following Sunday will also be a training session at Letchworth - so encourage them to come along!